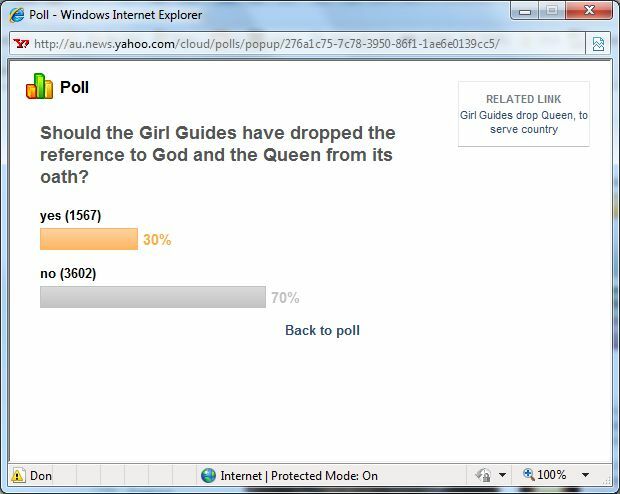 Girl Guides Australia is wrong if it thinks it will attract more members by removing any reference to The Queen and to God. Loyalty and obedience, has always been a fundamental part of Guiding but this is also to be replaced with something like ‘choices for a better world’. And all this to cater to those children – or more probably their parents – who have republican sympathies and/or who are irreligious. However, it seems to be an oxymoron, that this misguided organisation removes mention of The Queen at a time of her great popularity and when polls are showing an increasing majority of Australians wanting to remain a constitutional monarchy. Moreover, they are retaining the name of the Guide's highest honour, ‘The Queen's Guide’ and also keeping as their Patron, the Governor-General, whom they seem to forget is The Queen’s representative! Pandering to small minorities, however influential, has cost our Federal government almost total popularity. 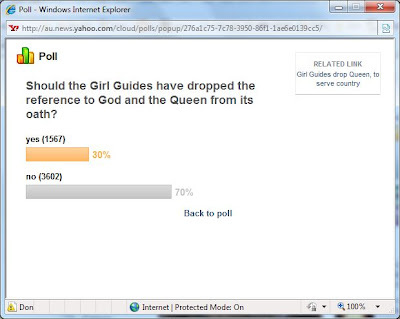 If the Girl Guides think they will achieve greater numbers by removing the very essence of what they are, then I feel they are sadly mistaken. At one time parents would send their daughters to the Guides to encourage self discipline and leadership. Now it seems all they will get is a cringing towards political correctness. Voting is open until next Monday, go here to click for the right answer. The Australians for Constitutional Monarchy published a protest nore as well. See here. It deals with various aspects of British history and culture, so I thought you might find it of some interest.